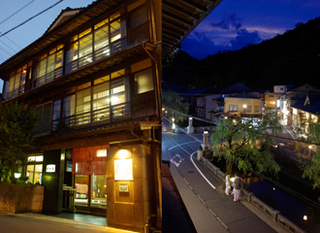 Among the oldest ryokans in Kinosaki Onsen, Kobayashiya is located in the center of town along the willow-lined river. Sit back and watch the lanterns flicker to life at nightfall and people scurrying below between onsens in their yukata from the comfort of the riverside rooms’ covered verandas. The garden rooms are perfect for guests who wish to have a more reclosed stay. 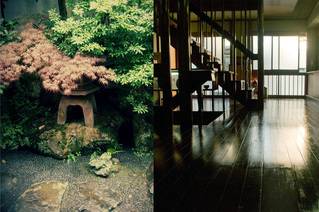 Slide open the shoji windows to look out onto the simple and lush Japanese garden. Great care is given by the owners in order to preserve the ryokan’s original beauty from the original flooring to repapering the shoji. Thanks to the proprietors’ care through the years Kobayashi was registered as a Tangible Cultural Property of Japan in 2015. You can find small retro scenes throughout the building that are hard to find in other ryokans. All meals are served in your room to ensure maximum relaxation. 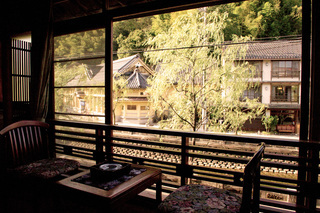 After your meal soak in the ryokan’s main bath or use your free onsen pass to visit the 7 hot spring bath-houses in town. 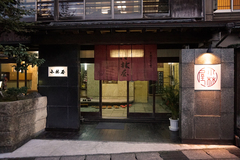 Kobayashiya also provides special vegetarian meals with advanced reservations. Please contact the ryokan when you make your reservation to request a vegetarian meal for more information. 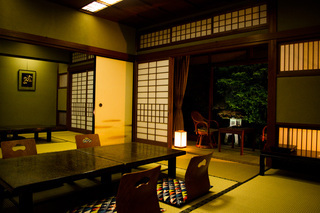 Kobayashiya is an international ryokan that warmly welcomes guests from all over the world and has English speaking staff ready to make your stay a memorable one. The perfect view of the center of Kinosaki from your room. View from one of our riverside rooms. - Free WIFI is available throughout the entire inn. -In the winter hot water bottles are available for our female guests (limited amount).